SHARON WESTLAKE has been performing professionally for many years on the Southern Ontario club circuit. 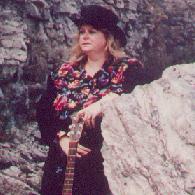 Her versatility enables her to deliver everything from a traditional heartbreaker to a driving country-rocker, as shown on her current CD "Global Stagecoach". Hot off the heels of a string of "hits", Sharon presents some sizzlin'.......new stuff, along with many of her radio favorites in a complete package that draws attention to her undeniable talent.